We really love the idea of using neutral colours to decorate a home and in this instance, the designers at Ando Studio outdid themselves by using a really cool palette of white and grey to create a serene home. This gorgeous apartment in Tel Aviv, Israel offers a calming respite from the busy city outside its four walls and will make you feel right at home immediately. This apartment features high ceilings and has oversize windows that gives it a spacious, roomy look due to the abundance of natural light that streams in to the home. 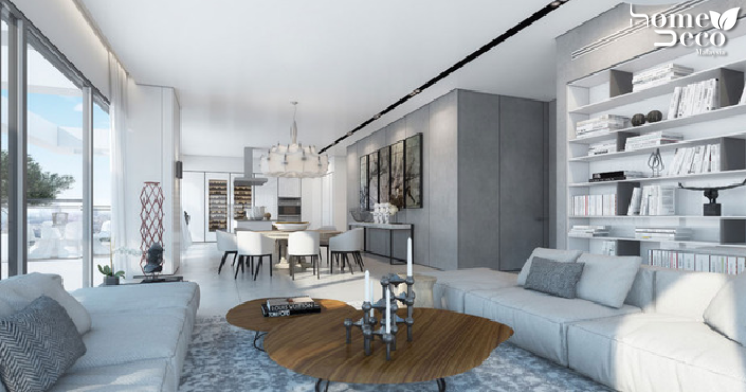 An open concept layout throughout the home with understated yet elegant furnishings give it a very sophisticated ambience that isn’t overpowering. The decor in this home is more on the minimalist side with a touch of modernity as can be seen by the rich brown coffee table in the living room that becomes a focal point and the swanky kitchen that looks like it came from a high-end restaurant. From the dining area, this space is more whimsical as the designers decided to turn it into a literal work of art by displaying various pieces of art here that comes complete with a quirky chandelier. In the bedroom, the decor is kept basic but comfy, continuing with the theme of the rest of the house. There is a low bed on the floor so that it does not distract from the panoramic view of the city’s skyline beyond the windows and the rest of the decor follows suit, by maintaining a low-lying profile. Meanwhile, another bedroom in the house leans more towards the fun and playful side as it has more colourful elements that helps liven up the space considerably. Details such as a cute little figurine, colourful rug and elaborate snowflake pattern on the wall makes it a truly dreamy bedroom.